Home » Photography Techniques » Is Your Browser Color-Managed? I recently posted an article on how to calibrate a monitor, but completely forgot to mention about using color-managed applications. Whenever you deal with different color profiles on your pictures, you should always use color-managed applications. Otherwise, some of the pictures could appear abnormal and the colors could be way off. One of the most basic applications that we would expect to have integrated color-management is our Internet browser that we use everyday. Surprisingly, many of the most popular browsers such as Internet Explorer, Google Chrome and Opera simply ignore color profiles embedded into pictures. Therefore, for ultimate photo-viewing experience, you should always try to use a color-managed browser. The best and the most popular color-managed browser is Mozilla Firefox. It is my favorite browser and I use it primarily to surf the web. Mac users do not have to deal with this, because the Apple Safari browser already has full support for color profiles. Take a look at both of the below images on your browser. If they look identical as far as colors are concerned, then your browser is color-managed. If the second image below appears to have a dark blue/magenta sky with yellowish sand, then your browser is not color-managed. If you see any differences between the above pictures, you should change your browser! I am puzzled. I am using Firefox but those images are different in colour. The skies are the same, but the land area is different, with the land area being paler in colour, including the mountain area. What version of Firefox are you using? Make sure that your version is at least 3.5. Also, what monitor do you have? If the colors are just slightly different, it is not an issue. But if it is very noticeable, then something might be wrong with your browser and/or monitor settings. Many thanks for responding. I have the latest version of Firefox – I always update as soon as one is available. I have a Dell 1909W. It isn’t drastically noticeable just slightly lighter on the bottom image. I tried moving it up the screen to see if the colours altered – I thought perhaps it might be the monitor but the colours didn’t change. In the bottom image I get more detail in the mountains. Kerry, according to TFT Central, your monitor is “TN Film”, which means that it is not a good monitor for photography – the color reproduction is not good on TN monitors. That’s probably why you are seeing different images. I have plenty of PCs at my work and I tried using Firefox on 3-4 of them (not calibrated) and all of them display both images identically. One thing you should try, is resetting your monitor brightness/contrast levels to factory default. Also, what happens when you view the above images in Internet Explorer? Do you see the same problem or do the images look substantially different? Thanks for your further advice. I have just checked the image using Internet Explorer and the difference is amazing: you would think they were two different images the colours are so different. I have also reset to the factory settings but I still get the difference with firefox I can only assume it is down to the monitor being a TN monitor. Unfortunately I only recently bought this one and I wasn’t aware at the time about the different types of monitor and what was best for photography. We live and learn and once again I have learnt a lesson the hard way. :-( Thanks for the time and effort you are putting into these really informative articles. Kerry, you are most welcome! for the people on Firefox who see this little difference. I think it’s the vertical view angle. if you move your head up/down they will be the same. At least that’s my experience whith Firefox on lcd screen. I’m also confused because i’m using Google’s Chrome web browser and the pictures look exactly the same for me. Maybe Google added color profiles within the past few months? This post was made on April, and it’s now August. hmm. Perhaps this guide needs a update. I have Asus ProArt 248Q Monitors by the way. Proof about all browsers? Post a link, please. Not just words of wisdom, because we can pretend to be professional on the Net. I found out your website while going over a post from Matt Kloskowski where you left a comment recently (some sunrise special spot). Anyway going over this article I noticed that using macos x and Google Chrome (rel. 5.0.375.28 dev) both images have the same colors. Not sure about linux/windows Chrome versions but with mac you’ll be safe. Regards and congratulations for the fine blog site, went directly to my list of sites to review often. Thank you Rodrigo, appreciate your feedback! Yes, one more person reported that Chrome on MacOS is color managed :) I will update the article to reflect this, since it is now fully confirmed. This is great, useful info, Nasim! How did I not know this? :-) I’ll be passing your link on to my favorite online art community (onlinevisualartists.com). Unfortunately, I cannot view the above URL because it requires registration. But thank you for posting it, I really appreciate it! Wendy, thank you very much for posting the link! I have just checked all available Mac OS Browsers and was amazed of the result. Firefox 3.0.19 – No / Firefox 3.6.6 – Yes! Jessica, thank you for sharing these, it is great to see that most browsers support color management on Macs! I am using IE 9 (9.0.8) and surprisingly it appears that this version is color managed.. I cannot figure out any difference in IE 9 between the two images, whereas the current chrome that I have, the differences are substantial.. Thanks for the info Nasim.. !! On my Mac running 10.5.8, both Safari 4.0.2 and Firefox 3.6.8 pass the “no difference between images” test (here and elsewhere), yet display the images very differently between them, much more saturation on Firefox. However, compared to color managed images in Photoshop, Safaris is correct, Firefox is way off! It may be that Firefox has a problem dealing with my wide-gamut monitor that Safari manages properly. Another nuance. Thanks for making this available. Rick, you are most welcome! It is interesting that you have such a difference in Firefox. I’m also using a wide-gamut monitor and Firefox 3.6.8 is showing both the same. So I replicated the test at work, where I have an older Apple Cinema (normal gamut) monitor. All of the images are identical, on both Firefox and Safari. Same computer. So Firefox somehow fails when it is faced with my HP wide gamut monitor at home but works with your wide gamut monitor! Very odd, but good to learn. Rick, is your monitor calibrated at home? Both monitors are hardware calibrated. I first read this post on my iPhone and the photos look different. I was surprised since I the iPhone uses Safari. Hmmm! I just love the way you have said it all in this article. Keep up in the good work. and internet explorer stopped displaying the background colors of all the websites I visit. All what I see is a white background with no colors effect. My Microsoft office is also affected and only displays a grey background what do I do? First of all, thank you very much for this explanation on color-management in browsers. I used to work with opera and was never really happy with the results so i switched over to firefox now. I have got a Dell U2711 monitor so I downloaded the fitting profile from www.tftcentral.co.uk/artic…ofiles.htm and set it as default in the firefox-options and the Windows systempreferences as well. But now a new problem occurs: both pictures you mention above look perfectly the same now in firefox but they look neiter like the first nor the second one in opera. Though they tend to look more like the ProPhoto RGB with dark sky and yellowish sand but not completely the same. I am confused now – what did I do wrong? 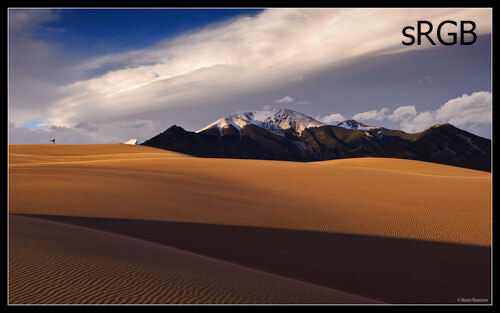 I expected both pictures to look like the sRBG-file as displayed in Opera with bright sky and reddish brown sands. zinzun – I belieive your iPad shows different-looking images because iOS devices just aren’t color managed at all! Your website is very helpful. I use Explorer 9 on a Windows 7×64 computer with a wide gamut monitor (NEC P221W, properly profiled). You know, what? The two pictures look identical. Adobe RGB is worse than sRGB, swap back or change to ProPhoto. I appreciate the logic in your statement, but ProPhoto is the picture profile that gives the best results. Just make sure you’re embedding the “ProPhoto RGB) color profile during the “Save As” dialog box in photoshop. K. Rockwell has a good comparison if you’re interested. Thank you again for the excellent article. I have a quick question and would like to know your advise about it. I think my adobe lightroom gives me different colors if I encode images by different color profile. Am I missing anything? I believe that adobe lightroom should manage it well. Or is it that the color will always look quite different if I encode it by different profiles. Any suggestions would be highly appreciated. Hi Nasim, thank you for another helpful article. I have been visiting your site almost daily, it is one amoung the best and very useful site. I have subscribed to your feeds and it is very helpful. I learnt a lot of things from your site; recently bought ASUS PA 238 based on your recommendation and very happy with it. For me, your site provides wealth of relevant information. Thank you so much for your effort/help. Why use prophotoRGB at all when it has lousy support? When you’re a photographer and want people to see your photo’s how they are meant. just use sRGB. Prophoto isn’t supported on tablets and phones and sRGB always is. Most monitors aren’t able to show prophotoRGB’s range anyway. Keep it in in your workflow, but don’t export it to the web. I was interested in this article, because I have noticed the term monitor calibration – as I have seen this term before, but did not know what it really meant. I have read your other article related to monitor calibration, and it all makes sense now. The first post caught my eye because I have the same problem. The colors are a little different with the mountains showing a little more detail. I use Mozilla, and keep it up to date. So I did try Internet explorer and found that the mountains have a little more detail, but the colors actually appear a little different. After reading the other article on calibrating your monitor, I found my monitor is a PnP. Through this article, I found that when photography websites post their photographs, they appear oversaturated at times with sun streaks or just oversaturated in general when I view. Do you know about PnP monitors? (I will research a little myself). Also, upon receiving my computer, I found the glare from the monitor unbearable, so I bought an antiglare monitor overlay. Will this make a difference in how colors are viewed as well? Lastly, no wonder, I am hesitant to perform post production. I always feel the colors/ saturation etc are off. I found the information I was looking for, along with the tutorial on calibrating your monitor in Windows 7! I read this article, with interest. Colour perception is so subjective, and as you have mentioned, which browser you can use can make a significant difference! I have tried all most of the popular browsers, and until recently found Firefox, the best. However, more recently, after upgrading to Windows 8, I have found Internet Explorer 10 gives better colour rendition. Images that I post on Flickr (www.flickr.com/photo…[email protected]/) correspond very closely to those on my monitor, using IE Ten. I am a keen photographer, and undertake my editing in Photoshop CS6! I always processing in 16 bit, and in ProPhoto RGB colour space. However, for posting on the internet, I have found it is essential to convert back to sRGB; otherwise, the browser will make the conversion, usually doing a poor job! I have tested firefox, Chrome & IE. The photos look different in all of the above browsers. I think I am in the same situation as what you replied to Kerry. I am using Windows XP and a DELL E178WFP monitor. Thank you for your information. I know monitor is just like any other merchandises, good one expensive; not so good one cheap. But to those manufacturers out there, I can not accept a colour monitor that can not display colours to approximate. Try Opera. It’s the only one that’s color managed. Everybody talks about aRGB in terms of image editing. I wonder why nobody tells how they watched video. It must certainly look better. sRGB should look different from ProPhoto RGB as the sRGB profile clips the color gamut significantly. We ran in to issues using sRGB for showing proofs for Print Projects. We now show them using the embedded CMYK profile with a reduce resolution. Monitors and Graphic Cards have improved significantly. However even with color corrections for you montior and graphics card, no two correct to match. I have three monitors connected to my Dell work station with the identical graphics cards for each and I cannot get them to match. So customers out their without color corrected monitors may be seeing something much different that what you are supplying. To elaborate on color correcting monitors: Even with multiple high end monitors connected to the same graphics cards (one for each monitor) within the same high end computer, it is almost impossible to get them to match exactly. Few customer color correct their monitors, so customer monitors are going to very widely as to how they render color. A very few good, a many not so good and most poorly. The best we can do is make sure our monitors are rendering color as close as possible. Printer Art Departments can calibrate their monitors using G7 standards. IE: Monitor calibrated to match their Ink Jet proofing system which is calibrated to match their press.